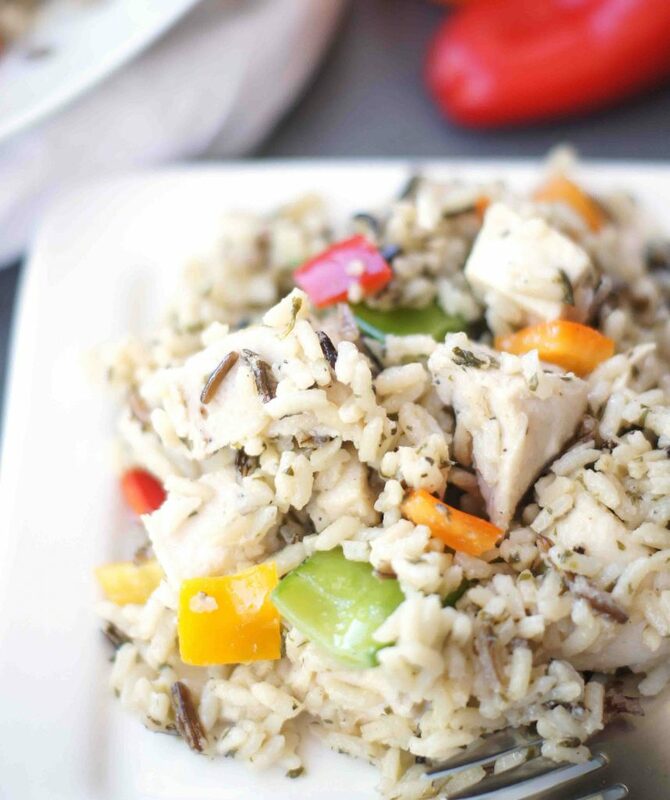 Packed with flavor and incredibly simple to make, this Santa Rosa Rice salad will honestly become one of your favorites! I’m winding down from a crazy, fun, chaotic and momentarily WET weekend. 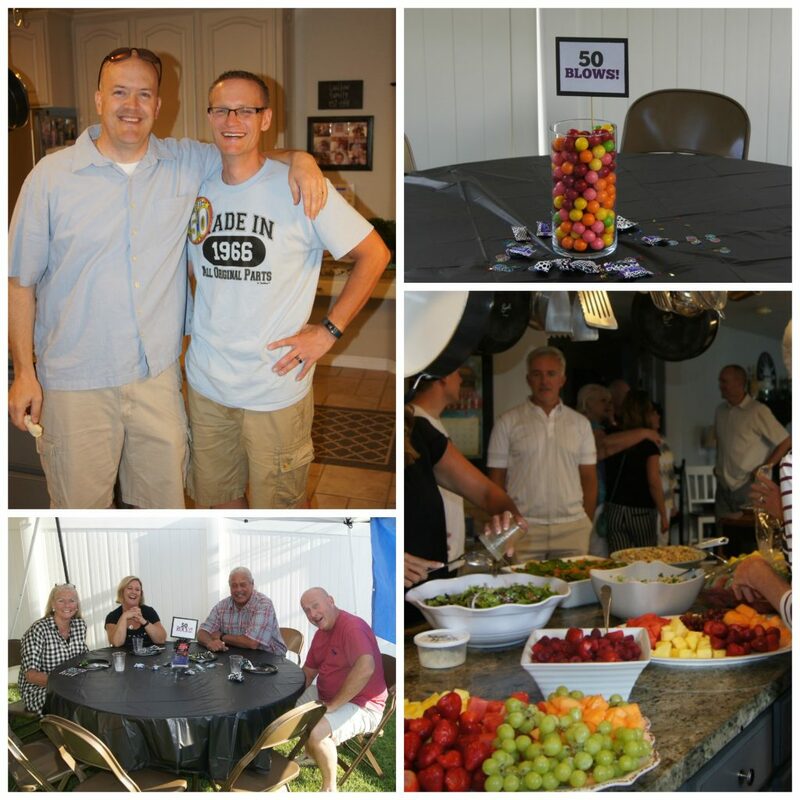 I did an open house with our family and friends to celebrate my husband turning the big 50! I’d like to say it went off without a hitch, but it had a bit of a rough start. Let’s talk about this salad first and then I’ll fill you in on the party. This Santa Rosa Rice salad was one of the salads I served at the open house. It got rave reviews from everyone. I had actually had it a few weeks prior at an open house in my ward and when I asked my friend for the recipe she told me it’s in our ward cookbook. I can’t believe I hadn’t noticed it before. Anyway, it’s so fabulous, you just have to taste to it see what I mean. I love the flavor combinations of this salad. It’s so refreshing, so simple to make and can be eaten as a side dish or certainly as a main dish with the chicken in it. It’s just so, so good. Trust me when I say you’ve got to make this salad. I had several people ask me for the recipe after tasting it. Now, please just overlook the fact that this recipe calls for avocados and the avocados are nowhere to be seen in the photos. Yes, I completely forgot to put them in (ugh!) and I just could not bring myself to pull my camera back out and restage everything. So please forgive my forgetful brain and just pretend that you see beautiful, delicious avocados in the salad. 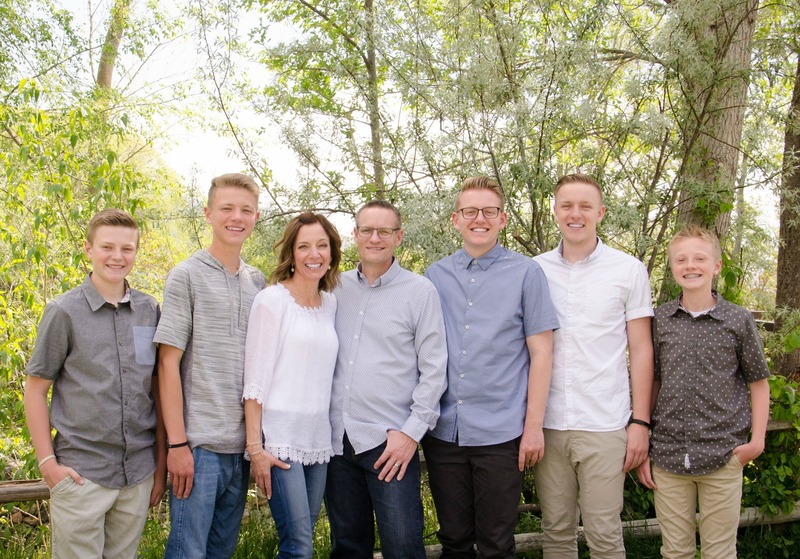 Now about the open house, it’s been hot and dry here in Utah for weeks and week. I had been watching the weather closely hoping for some cooler temps this past weekend. I was ecstatic when I saw it was only supposed to hit 90 for the high on Saturday. That was about 10 degrees cooler than earlier in the week. Friday evening was so beautiful, cool, no wind. . . it was perfect. I told my husband I hoped Saturday night would be just like that. We got all the tables, chairs and canopies set up, and the table decorations were on. It was sunny, blue skies and pretty warm, but not bad in the shade. It wasn’t as cool as I’d hoped, but it really wasn’t bad. It started to get a little cloudy and overcast which I was kind of happy about because it wouldn’t be so hot. The party was just about to start and we were just getting ready to take the food outside when it started lightly sprinkling. The food tables were under canopies so I wasn’t worried. Then it all changed and raindrops were no longer just little sprinkles and before we knew it, it was dumping. It was coming down so hard and the wind was blowing and the canopy-covered tables and chairs were getting drenched. SERIOUSLY?! How could Mother Nature pull that one on me. It hasn’t rained all summer! 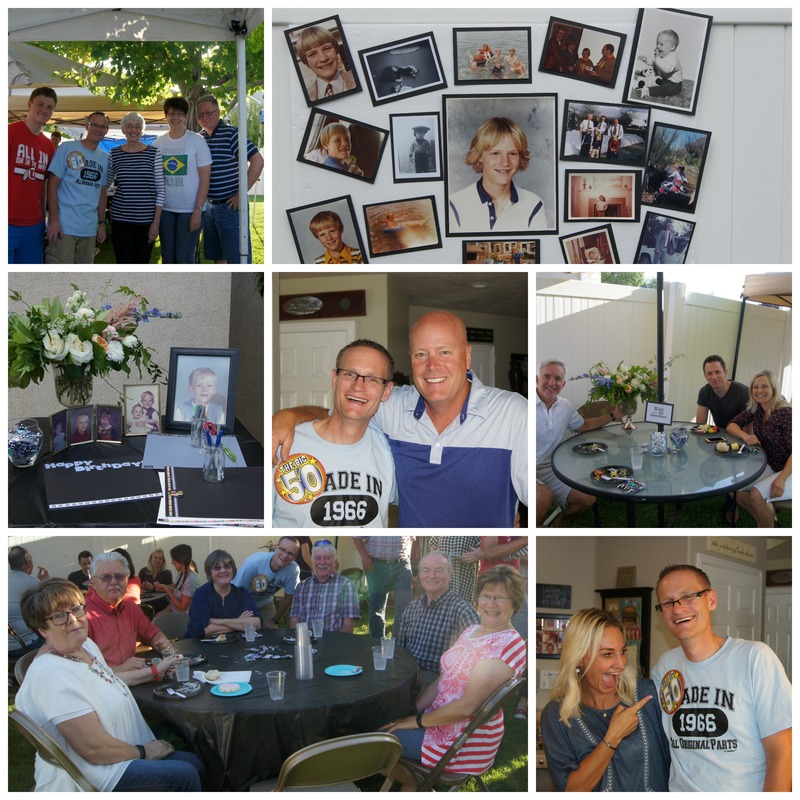 Thanks to the help of family and friends we frantically scrambled and grabbed some chairs, the photos and the table decorations and brought them in the house. We just laughed! How could we not? The picture above isn’t great, but you can see the wind had blown tablecloths off and was coming down pretty hard. 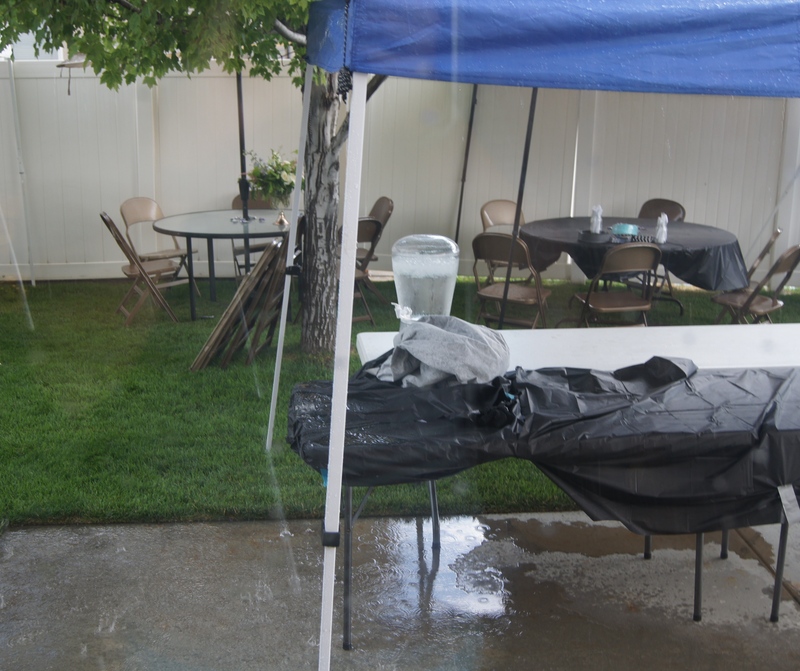 It all worked out, the rain stopped after about 15 minutes and we grabbed towels and started drying off tables and chairs, emptied all the rain out of the canopies that had filled up like swimming pools and the party still went on. The food was fabulous and it great to see so many people come to wish Rich a Happy 50th. We have the greatest friends and family ever! A huge thank you to everyone that helped with food, I couldn’t have done it without you. The last time I made this I actually left the Chinese Pea Pods out because they've been kind of bitter the last few times I've bought them. I think I actually liked it even better without them. Sugar snap peas would be a great substitute if you can't find good pea pods. I also think this salad would be delicious with fresh cilantro added to it. I'm definitely going to try that next time. Prepare rice according to package directions. Set aside and let cool. 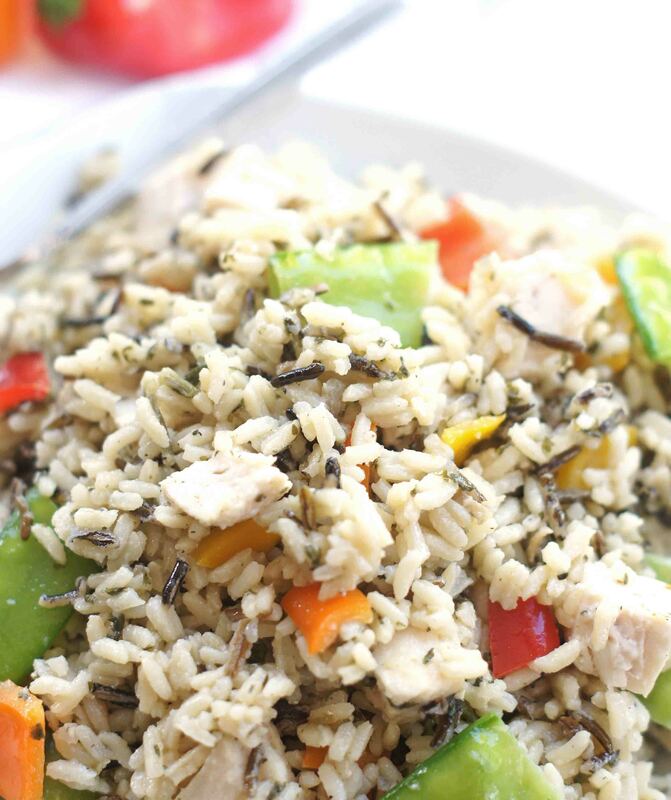 Once the rice has cooled, put into a large bowl and add chicken, peppers and pea pods. Make the dressing by combining all the ingredients and whisking until well blended. Pour over rice mixture and stir until mixed well. Refrigerate for at least 3 hours before serving. Add avocados and pecans (if using) just before serving.